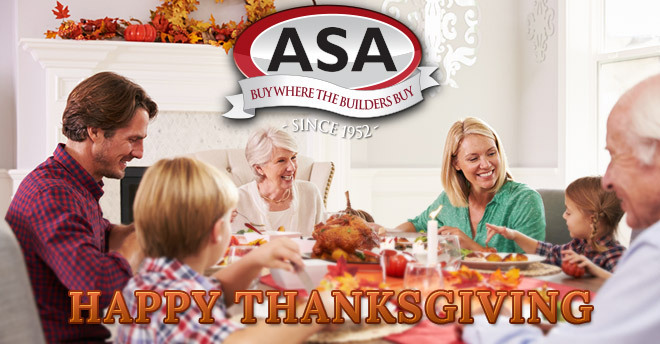 The entire ASA team wishes you and your family a joyous Thanksgiving. Every holiday season we are reminded that our customers make our work a truly rewarding experience. Not only do we have the distinct privilege of working with an excellent team, but we also serve the most caring community around! Since 1952 ASA Builder’s Supply has been influenced by our customer’s support. The unparalleled craftsmanship and superior pricing we offer today would not be possible without this deep connection to the community. Thanksgiving is a special time to give thanks to the people we love and the friends we cherish. May you enjoy peace, relaxation and warm memories with your family this Thanksgiving.